Two young women on a road trip to California. But nothing has been heard from Jay and Nicole for three days — their last contact a phone call to Jay’s father from New Mexico. The cops aren’t worried: three days is hardly an eternity. 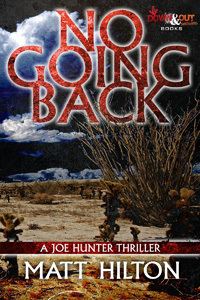 But Jameson Walker is not taking any chances and hires Joe Hunter to find his little girl. The Arizona desert is badlands country and the friends have fallen foul of a sadistic bunch of men who are as brutal as their surroundings. But Joe is on their trail and he’ll do anything to free the women. Even if it means dying, there’ll be no going back.